NodeMCU is an open source IoT platform. It includes firmware which runs on the ESP8266 Wi-Fi SoC from Espressif Systems, and hardware which is based on the ESP-12 module. … It is based on the eLua project, and built on the Espressif Non-OS SDK for ESP8266. It uses many open source projects, such as lua-cjson, and spiffs. How to program it using Arduino IDE? click OK to close the preference Tab. 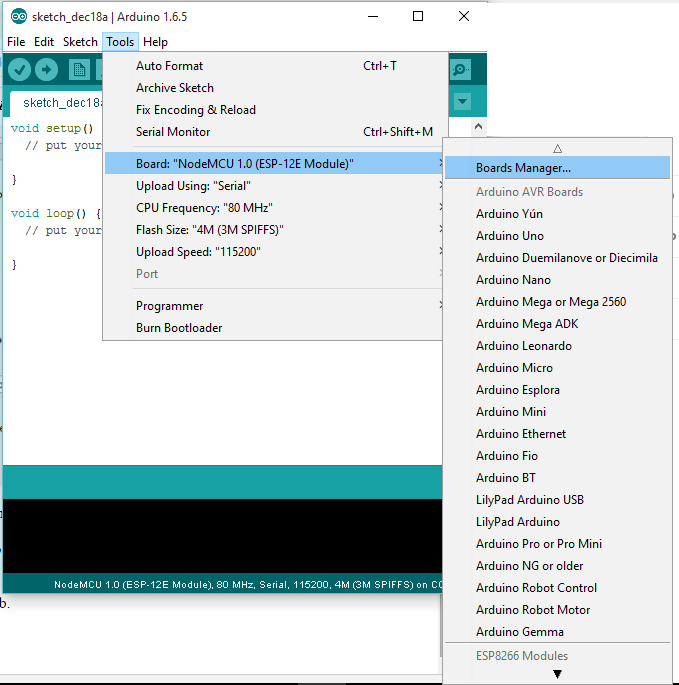 Navigate to esp8266 by esp8266 community and install the software for Arduino. Once all the above process been completed we are read to program our esp8266 with Arduino IDE. For this example I have used NodeMCU esp8266 and if you are using any other vendor wifi chips or generic wifi module please check with the esp8266 Pin mapping which is very essential to make things works.